The waste vitrification of abandoned open sky vermiculite deposits has been considered by combining with a natural phosphate mineral residue. Several batches haven been designed from the composition system: Li2O-MgO-Al2O3-P2O5-SiO2 including some Fe2O3 and Fluoride. The resulting glasses are transparent and smooth green coloured, giving rise after TTT treatments to several opal, opaque glass-ceramics with iridescent surface. Full characterization has been carried out by XRD and electron microscopy with EDS, as well as by XPS spectroscopies, concluding that the main crystalline phases formed were alpha-cordierite and beta-spodumene. The surface of these glass-ceramics from vermiculiteamblygonite is enriched in Fe2O3. Compared to the parent glasses, the final glass-ceramics exhibited and improvement in fracture toughness. Here, a kinetic study of the thermal decomposition of synthesized hydrotalcite, Mg-6 Al-2 CO3(OH)(16)center dot H2O, has been carried out using thermogravimetric experiments in air atmosphere. It is shown that the thermal decomposition occurs in two well differentiated stages. The first one is a single-step dehydration process that comprises the release of four water molecules. On the other hand, the second stage is complex and corresponds to both dehydroxylation and decarbonation processes which occur simultaneously. The kinetic parameters describing all processes were calculated by means of a combined approach comprising isoconversional, model-fitting and deconvolution methods. It was concluded that dehydroxilation and decarbonization cannot be separated by TG experiments and the two stages contributing to the complex process do not apparently match the expected stoichiometry of the process. Therefore, it is proposed that such stages mark a change on the reaction mechanism due to the structural collapse of the laminar double hydroxide. A Cu/TiO2 photocatalyst has been synthesised by reducing a Cu precursor with NaBH4 onto the surface of a sulphate pretreated TiO2 obtained by a sol-gel procedure. The catalyst, that shows a clearly defined anatase phase with high crystallinity and relatively high surface area, and contains Cu2O and CuO deposits on its surface, has been used to produce hydrogen in a solar driven pilot plant scale photocatalytic reactor. Different electron donor aqueous solutions (methanol, glycerol, and a real municipal wastewater treatment plant influent) have been tested showing similar or even higher energy efficiency than those obtained using more expensive noble metal based photocatalytic systems. The glycerol solutions have provided the best reactive environments for hydrogen generation. The reaction mechanism of the reverse water gas shift (RWGS) reaction was investigated using two commercial gold-based catalysts supported on Al2O3 and TiO2. The surface species formed during the reaction and reaction mechanisms were elucidated by transient and steady-state operando DRIFTS studies. It was revealed that RWGS reaction over Au/Al2O3 proceeds through the formation of formate intermediates that are reduced to CO. In the case of the Au/TiO2 catalyst, the reaction goes through a redox mechanism with the suggested formation of hydroxycarbonyl intermediates, which further decompose to CO and water. 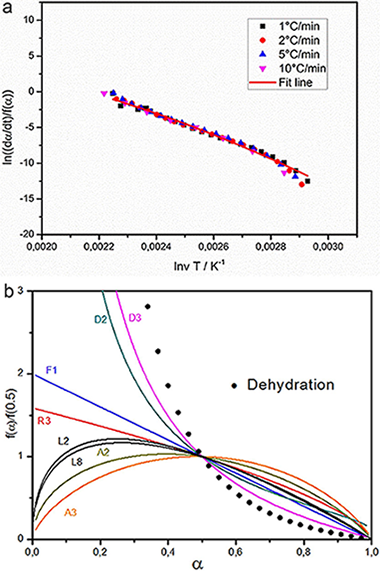 The Ti-3+ species, the surface hydroxyls, and oxygen vacancies jointly participate. The absence of carbonyl species adsorbed on gold particles during the reaction for both catalysts indicates that the reaction pathway involving dissociative adsorption of CO2 on Au particles can be discarded. 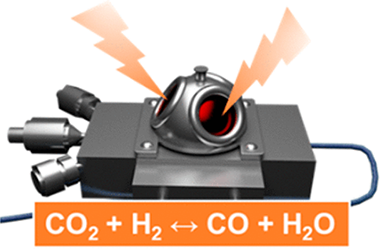 To complete the study, operando ultraviolet visible spectroscopy was successfully applied to confirm the presence of Ti3+ and to understand the role of the oxygen vacancies of TiO2 support in activating CO2 and thus the subsequent RWGS reaction. 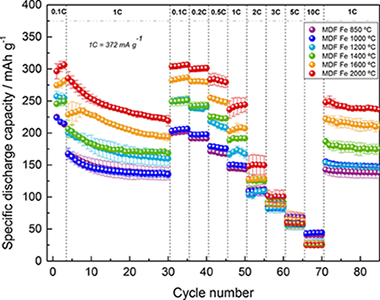 Graphitized carbon materials from biomass resources were successfully synthesized with an iron catalyst, and their electrochemical performance as anode materials for lithium-ion batteries (LIBs) was investigated. 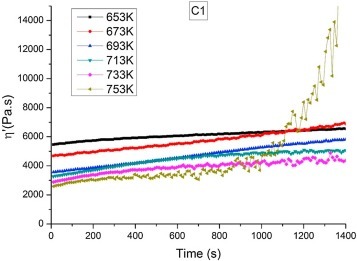 Peak pyrolysis temperatures between 850 and 2000 degrees C were covered to study the effect of crystallinity and microstructural parameters on the anodic behavior, with a focus on the first-cycle Coulombic efficiency, reversible specific capacity, and rate performance. In terms of capacity, results at the highest temperatures are comparable to those of commercially used synthetic graphite derived from a petroleum coke precursor at higher temperatures, and up to twice as much as that of uncatalyzed biomass-derived carbons. The opportunity to graphitize low-cost biomass resources at moderate temperatures through this one-step environmentally friendly process, and the positive effects on the specific capacity, make it interesting to develop more sustainable graphite-based anodes for LIBs. 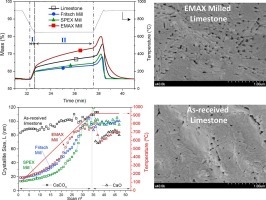 This work analyzes the relevant influence of milling on the CO2 capture performance of CaO derived from natural limestone. Diverse types of milling mechanisms produce contrasting effects on the microstructure of the CaO formed after calcination of the milled limestone samples, which affects crucially the kinetics of carbonation at conditions for CO2 capture. The capture capacity of CaO derived from limestone samples milled using either shear or impact based mills is impaired compared to as-received limestone. After calcination of the milled samples, the resulting CaO porosity is increased while crystallinity is enhanced, which hinders carbonation. Conversely, if the material is simultaneously subjected to intense impact and shear stresses, CaO porosity is promoted whereas CaO cristanillity is reduced, which enhances carbonation in both the reaction and solid-state diffusion controlled regimes. Biodeterioration of stone monuments is estimated to be as high as 20-30% of the total degradation suffered by Cultural Heritage constructions. With regard to this problem, bactericidal treatments are mainly based on cleaning. These processes, while effective in the short term, require frequent reapplications increasing potential damages to the monument. Silver nanoparticles offer many advantages over traditionally employed products, such as their prolonged biocide efficacy and their low toxicity to humans and environment. 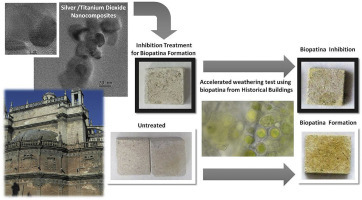 The aim of this study was to evaluate the applicability and effectiveness of seven nanocomposite treatments based on titanium dioxide and/or silver nanoparticles to prevent biodeterioration of limestone monuments. These nanocomposites were characterized by UV Visible spectrophotometry, Dynamic Light Scattering and Electron Microscopy. To assess their bactericidal activity, accelerated weathering tests were performed on limestones from the quarry of Utrera, a source widely employed in such iconic monuments as the Cathedral of Seville (Spain). Furthermore, the samples of biopatina employed in our assays stemmed from the fa ades of historical buildings from Seville. Our results show that silver and titanium dioxide nanocomposites stabilized by citrate achieve a high biocide effect while maintaining color alterations at a low level. Automatic lay-up and in-situ consolidation with thermoplastic composite materials is a technology under research for its expected use in the profitable manufacturing of structural aeronautical parts. This study is devoted to analysing the possible effects of thermal degradation produced by this manufacturing technique. Rheological measurements showed that there is negligible degradation in PEEK for the temperatures reached during the process. Thermogravimetric analysis under linear heating and constant rate conditions show that thermal degradation is a complex process with a number of overlapping steps. 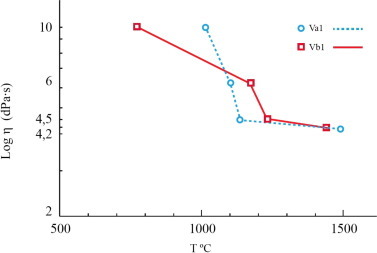 A general kinetic equation that describes the degradation of the material with temperature has been proposed and validated. Attenuated total reflectance Fourier transform infrared spectroscopy and X-ray photoelectron spectroscopy confirmed that there is no remarkable degradation. The use of a combination of in-situ and ex-situ experimental techniques, including kinetic modelling, not only provides reliable information about degradation but also allows setting optimal processing conditions. SiC-Si3N4 composites have been obtained by carbothermal reduction of rice husk under a nitrogen-argon atmosphere at 1450 degrees C, which is a lower temperature than those used by other authors. On the other hand, tailoring the argon/nitrogen ratio led to the obtained of SiC-Si3N4 composites across the whole range of compositions. Phosphoric acid treatment permited the synthesis of the composite without a pyrolysis step. The final products were characterized by X-ray diffractometry, IR spectroscopy and scanning electron microscopy. 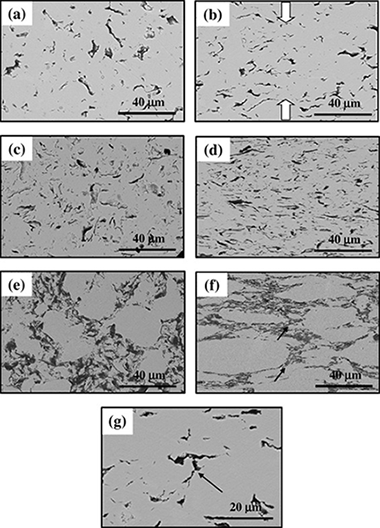 Yttria tetragonal zirconia polycrystalline (3YTZP) ceramic composites with 5, 10 and 20 vol% graphene nano-platelets (GNPs) were prepared by spark plasma sintering (SPS) and their electrical conductivity as a function of temperature was characterized. The composites exhibit anisotropic microstructures so the electrical conductivity studies were carried out in two directions: perpendicular (sigma(perpendicular to)) and parallel (sigma(parallel to)) to the SPS pressing axis. The composites with 5 and 10 GNP vol% showed high electrical anisotropy, whereas the composite with 20 GNP vol % exhibited nearly isotropic electrical behavior. sigma(perpendicular to) shows metallic-type behavior in the composites with 10 and 20 vol% GNP revealing that charge transport takes place through defect-free GNPs. For the composite with 5 vol % GNP the observed semiconductor-type behavior was explained by a two dimensional variable range hopping mechanism. sigma(parallel to)shows metallic-type conductivity in the composite with 20 GNP vol% and positive d sigma(parallel to)/dT slope in the composites with 5 and 10 GNP vol%. Combinations of perovskite-type oxides with transition and precious metals exhibit a remarkable self-regenerable property that could be exploited for numerous practical applications. The objective of the present work was to study the reversibility of structural changes of perovskite-type oxides under cyclic reducing/oxidizing atmosphere by taking advantage of the reducibility of LaCoO3. LaCoO3 +/- and LaCo0.8Cu0.2O3 +/- were prepared by ultrasonic spray combustion and were characterized by scanning electron microscopy (SEM), X-ray diffraction (XRD), X-ray absorption spectroscopy (XAS) and temperature-programmed reduction (TPR). XRD and XAS data confirmed that copper adopted the coordination environment of cobalt at the B-site of the rhombohedral LaCoO3 under the selected synthesis conditions. 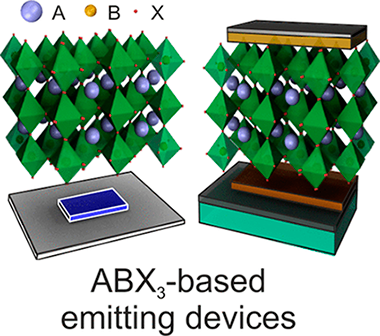 The structural evolution under reducing atmosphere was studied by insitu XRD and XANES supporting the assignment of the observed structural changes to the reduction of the perovskite-type oxide from ABB'O-3 (B'=Cu) to B'(0)/ABO(3) and to B'B-0(0)/A(2)O(3). Successive redox cycles allowed the observation of a nearly complete reversibility of the perovskite phase, i.e. copper was able to revert into LaCoO3 upon oxidation. The reversible reduction/segregation of copper and incorporation at the B-site of the perovskite-type oxides could be used in chemical processes where the material can be functionalized by segregation of Cu and protected against irreversible structural changes upon re-oxidation. The rapid mechanochemical synthesis of nanocrystalline CuFeS2 particles prepared by high-energy milling for 60 min in a planetary mill from copper, iron and sulphur elements is reported. 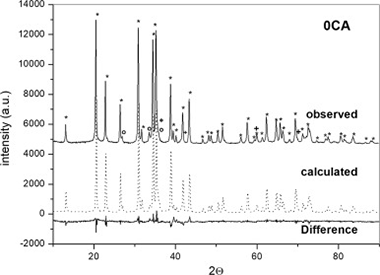 The CuFeS2 nanoparticles crystallize in tetragonal structure with mean crystallite size of about 38 ± 1 nm determined by XRD analysis. HRTEM study also revealed the presence of nanocrystals with the size of 5–30 nm with the tendency to form agglomerates. The Raman spectrum confirms the chalcopyrite structure. Low temperature magnetic data for CuFeS2 support the coexistence of antiferromagnetic and paramagnetic spin structure. Moreover, the hysteresis loops taken at temperatures from 5 K to 300 K revealed a presence of very small amount of ferromagnetic phase, which seems to be associated with the non-consumed elemental Fe in as-prepared nanoparticles. The optical band gap of CuFeS2nanoparticles has been detected to be 1.05 eV, larger than band gap of the bulk material. The wider gap possibly resulted from the nano-size effect. Photoresponses of CuFeS2nanoparticles were confirmed by I-V measurements under dark and light illumination. It was demonstrated that mechanochemical synthesis can be successfully employed in the one step preparation of nanocrystalline CuFeS2 with good structural, magnetic, optical and electrooptical properties. Medical grade of both titanium (Ti) and Ti6A14V alloy are recognized as the metallic biomaterials with the better outcomes for clinical repair of bone tissue thanks to their suitable mechanical properties and corrosion resistance. However, those Ti advantages are not enough to avoid failure risks of bone implants; between 5 and 10% of Ti implants fail due to a deficient osseointegration, within 5 years of post-implantation. Most of these failures indicate the necessity of getting a better biomechanical-biofunctional balance. Microstructural and tribo-mechanical characterizations were performed on Ti6A14V samples obtained by selective laser melting and subjected to different surface treatments (thermal stress relief, acid etching, chemical treatment and thermochemical treatment). Scanning electron microscopy and X-ray diffraction were used for detailed characterization of the elemental composition, phase analysis and surface morphology. Micro-hardness and scratch tests were employed to evaluate the tribo-mechanical properties, which were improved after consecutive surface treatments. Protuberances with spherical morphology, as a remainder of the original powder, were present on the surface. The resulting modified surfaces were constituted by rutile (major phase) and anatase (minor phase). Submicro-nano-topographies were obtained after the chemical and thermochemical treatments. Nanophosphor integration in an optical cavity allows unprecedented control over both the chromaticity and the directionality of the emitted light, without modifying the chemical composition of the emitters or compromising their efficiency. 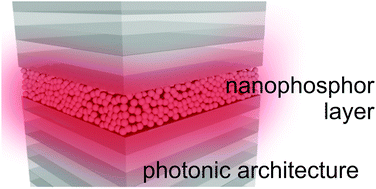 Our approach opens a route towards the development of nanoscale photonics based solid state lighting. Climatic stressors due to global change induce important modifications to the chemical composition of plant cuticles and their biophysical properties. In particular, plant cuticles can become heavier, stiffer and more inert, improving plant protection. The climatic stressors that modify the chemical composition of plant tissues have been recently reviewed by Suseela and Tharayil (2018). In particular, the authors stated that the response of plants to global change effects (viz. increasing temperatures and frequent drought periods) can induce important modifications in plant cuticles such as an increase of the main cuticle components (cutin and polysaccharides), a preponderance of cutan, heavier wax loads, and changes in the chemical composition of waxes, mainly the accumulation of longer aliphatic compounds. 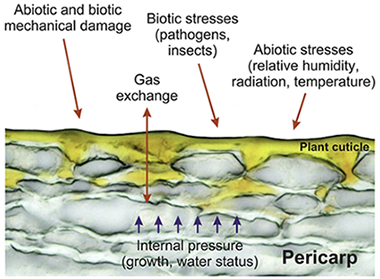 In this letter, we would like to emphasize the biophysical consequences that this new scenario involves and how it would affect plant performance. Herein we present a combined study of the evolution of both the photoluminescence (PL) and the surface chemical structure of organic metal halide perovskites as the environmental oxygen pressure rises from ultrahigh vacuum up to a few thousandths of an atmosphere. Analyzing the changes occurring at the semiconductor surface upon photoexcitation under a controlled oxygen atmosphere in an X-ray photoelectron spectroscopy (XPS) chamber, we can rationalize the rich variety of photophysical phenomena observed and provide a plausible explanation for light-induced ion migration, one of the most conspicuous and debated concomitant effects detected during photoexcitation. We find direct evidence of the formation of a superficial layer of negatively charged oxygen species capable of repelling the halide anions away from the surface and toward the bulk. The reported PL transient dynamics, the partial recovery of the initial state when photoexcitation stops, and the eventual degradation after intense exposure times can thus be rationalized. The development of smart illumination sources represents a central challenge for current technology. In this context, the quest for novel materials that enable efficient light generation is essential. Metal halide compounds with perovskite crystalline structure (ABX(3)) have gained tremendous interest in the last five years since they come as easy-to-prepare high performance semiconductors. Perovskite absorbers are driving the power-conversion-efficiencies of thin film photovoltaics to unprecedented values. Nowadays, mixed-cation, mixed-halide lead perovskite solar cells reach efficiencies consistently over 20% and promise to get close to 30% in multijunction devices when combined with silicon cells at no surcharge. Nonetheless, perovskites' fame extends further since extensive research on these novel semiconductors has also revealed their brightest side. Soon after their irruption in the photovoltaic scenario, demonstration of efficient color tunable-with high color purity-perovskite emitters has opened new avenues for light generation applications that are timely to discuss herein. Different carbon supported metal catalysts were synthesized, and characterized with various physico-chemical methods and tested in vanillin hydrodeoxygenation under 30 bar total pressure in water as a solvent at 100 degrees C. The catalysts exhibited high specific surface area and the metal dispersion decreased in following order: Pt/ C > Pd/C > Au/C > Rh/C > Ru/C. The most active catalyst was Pd/C followed by Ru/C. Vanillin hydrodeoxygenation proceeded via hydrogenation forming vanillyl alcohol further to its hydrogenolysis forming p-creosol. Both hydrogenation and hydrogenolysis were promoted by Pd/C, which exhibited rather high dispersion. The highest selectivity to p-creosol, 95% at complete vanillin conversion, was obtained with Pd/C. 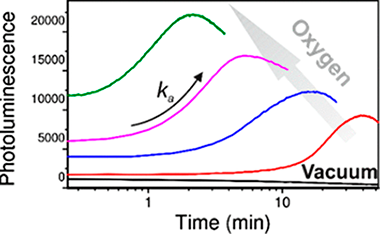 Kinetic modelling of vanillyl alcohol selectivity as a function of vanillin conversion was performed. Uniform Ba0.18Ce0.82F2.82 nanospheres have been obtained after aging a solution of barium and cerium nitrates and sodium tetrafluoroborate in a mixture of ethylene glycol and water at 120 degrees C for 20 hours. The diameter of the spheres could be tailored from 65 nm to 80 nm by varying the NaBF4 concentration while maintaining their colloidal stability in aqueous suspension. 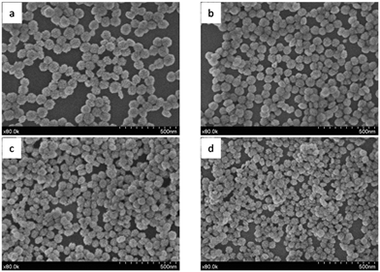 Increasing the aging temperature led to a phase transformation from hexagonal to cubic symmetry and to a concomitant increase of the Ba/Ce ratio, which reached a value close to the nominal one (50/50) at 240 degrees C. The same method was successful in obtaining Tb3+-doped nanospheres with homogeneous cation distribution and the same morphological features as the undoped material. 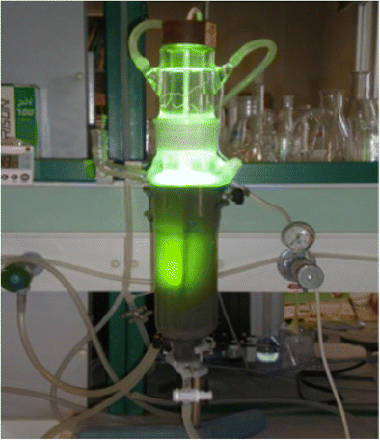 An intense green emission was observed after the excitation of the Tb3+-doped samples through the Ce3+-Tb3+ energy transfer (ET) band. The ET efficiency increased with increasing Tb content, the maximum emission being observed for the 10% Tb-doped nanospheres. Aqueous suspensions of the latter sample showed excellent X-ray attenuation values that were superior to those of an iodine-based clinically approved contrast agent. Their fluorescence and X-ray attenuation properties make this material a potential dual bioprobe for luminescence bioimaging and X-ray computed tomography. The design of hybrid mesoporous TiO2-SiO2(TS1) materials decorated with Ag and Pt nanoparticles was performed. The photocatalytic degradation of phenol under artificial solar irradiation was studied and the activity and selectivity of the intermediate products were verified. TiO2-SiO(2)was prepared by sol-gel method while Ag- and Pt-based photocatalysts (TS1-Ag and TS1-Pt) were prepared by photodeposition of the noble metals on TS1. 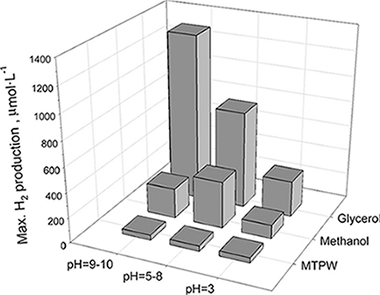 Two series of photocatalysts were prepared varying Ag and Pt contents (0.5 and 1.0 wt%). An increase in the photocatalytic activity up to two and five times higher than TS1 was found on TS1-Ag-1.0 and TS1-Pt-1.0, respectively. Changes in the intermediate products were detected on Ag- and Pt-based photocatalysts with an increase in the catechol formation up to 3.3 and 6.6 times higher than that observed on TS1, respectively. A two-parallel reaction mechanism for the hydroquinone and catechol formation is proposed. A linear correlation between the photocatalytic activity and the surface concentration of noble metals was found indicating that the electron affinity of noble metals is the driven force for both the increase in the photoactivity and for the remarkable changes in the selectivity of products.